This could well be considered a continuation of my last blog post, but does a fantastic job leading into some thoughts I've had recently on one of our great birding mysteries - grounded grebes and dead ducks! I ended the previous post noting that the ducks off my condo had ended the evening, swimming through channels of slush as the waters continued to freeze. 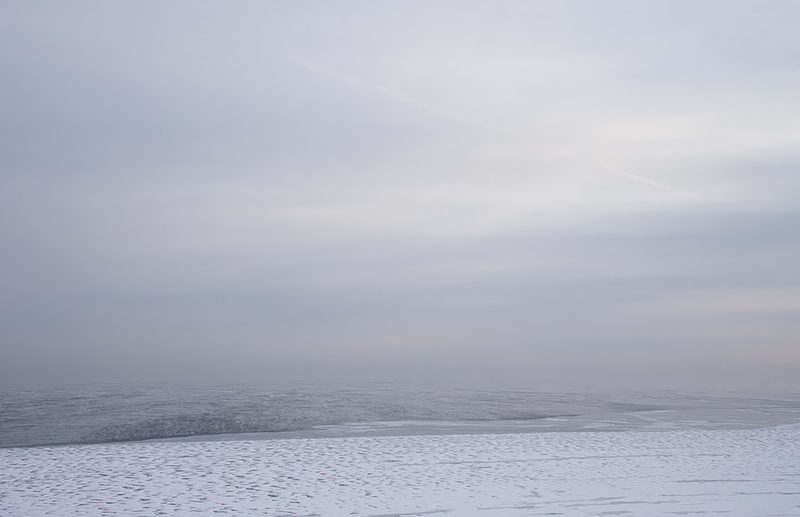 Some variation of this has been occurring for several days now, where patches of water open up and re-freeze due to wind, waves, water temperature etc. When I awoke the next morning, all of the remaining ducks (in a similar area) were squished into a small circle of open water that they had managed to keep open overnight. We are on pace for our coldest February ever, and ice cover on the great lakes has rapidly increased; reaching ~85% in recent days. In fact, for the past week, there is a greater extent of ice coverage (all lakes combined) than any previous (recorded) year - in the same calendar week... This has initiated the mass wanderings and groundings of waterbirds - especially grebes. 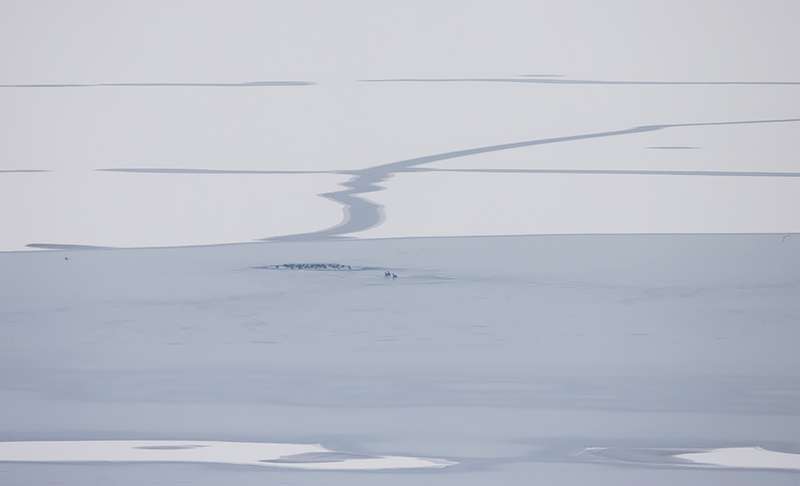 It is commonly stated that these birds have been "frozen out" of their wintering haunts due to this ice buildup, and inevitably crash somewhere they did not intend. 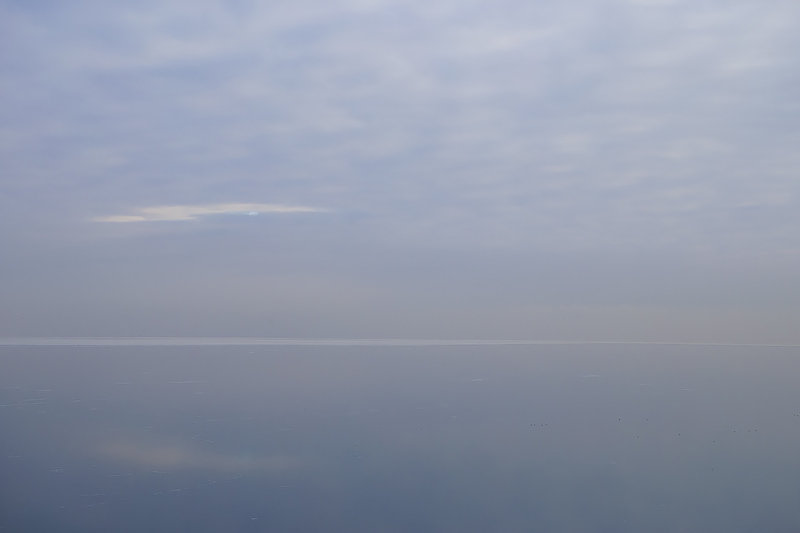 Yet as I watched Lake Ontario this past weekend, I once again found myself questioning that explanation. 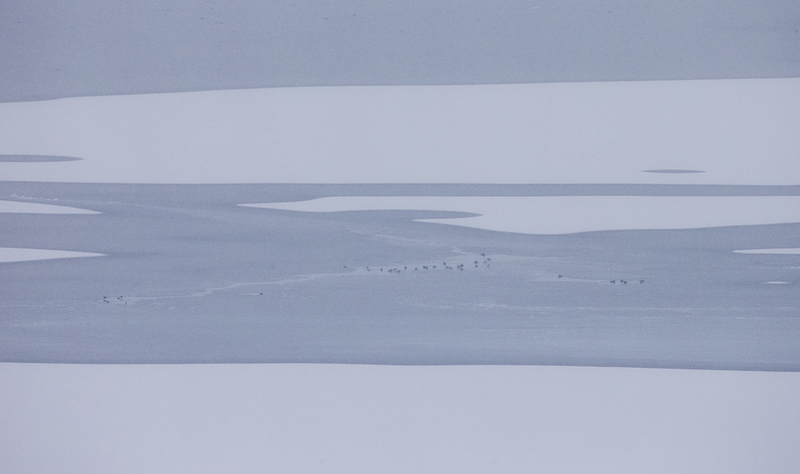 One of the more surprising observations, was various ducks (especially Red-breasted Mergansers, but also Long-tailed Ducks and White-winged Scoters) crash landing on the lake ice, seemingly at random. 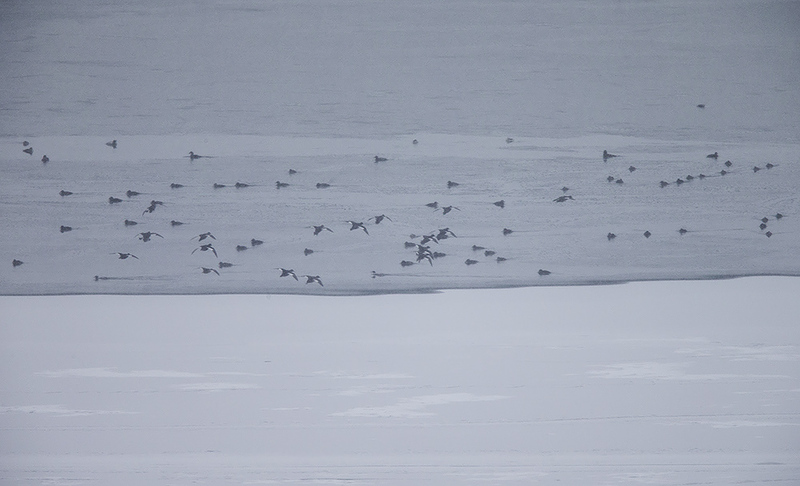 The above photo has 3 Scoters, and a lone Red-breasted Merganser (left edge) that had been drawn to the small circle of open water, yet just didn't make it. Sometimes the birds rapidly take flight, while others curl up and sleep for minutes to over an hour. A highly unusual place to take a nap, and this behaviour continued throughout the day. 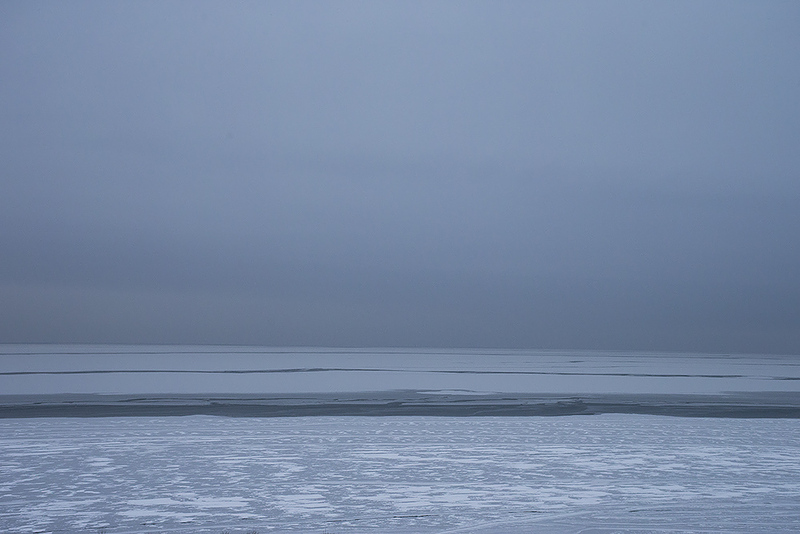 In the evening, a strong offshore wind blew, and considerable patches of open water were made as great sheets of ice floated away. The gull landed within inches of the duck, and I assumed it was all over - Great Black-backed Gulls are known for their predation of ducks - even at the best of times... 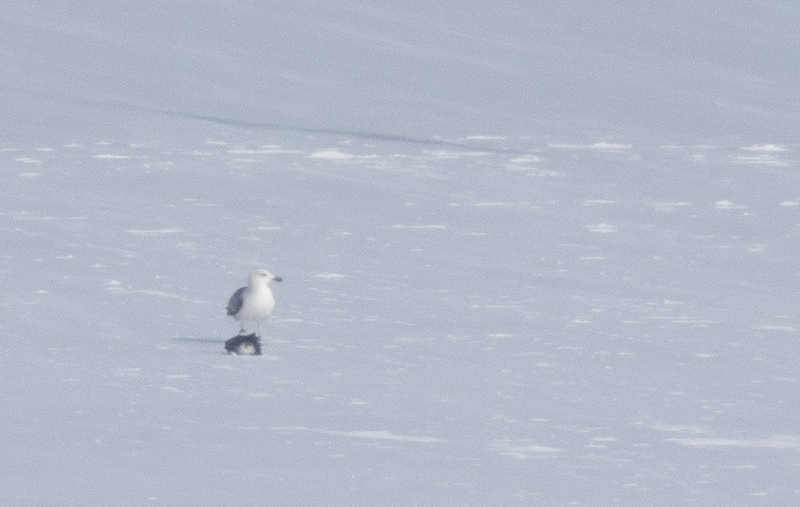 The Long-tailed would act aggressively if the gull lowered it's head, but made no attempt to fly away. I was surprised that the gull made few attempts to "end things" and seemed content to hang out. Sometimes the gull was successful in giving the duck a "shake" - yet other times the duck put up enough of a fight to win a small victory. After some back-and-forth, I was shocked to see the Great Black-backed Gull take flight and start to leave! Surely this little duck isn't too much of a challenge? Yet the gull flew steadily away - before approaching a grounded Red-breasted Merganser! The Merg seemingly knew better, and immediately started running away, and quickly escaped the immediate danger. 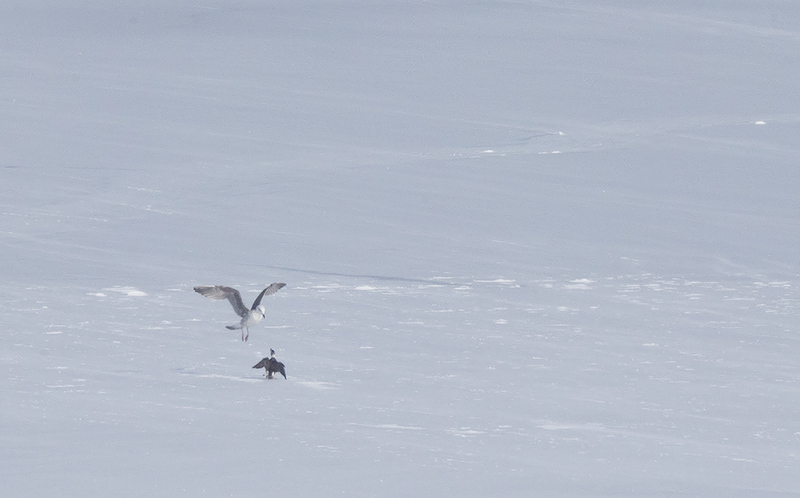 Then the gull flew right back to the Long-tailed Duck - WHICH MADE NO ATTEMPT TO ESCAPE! Why little duck, why? So what did I learn from all of this? It's just a guess - but watching this Long-tailed Duck take a "Great Black-backed beating" - while clearly capable of flight - no more than 100 meters away from open water - I couldn't help but think that the ice coverage of the great lakes has nothing to do with the distress of these birds... In fact, it was the Oakville Painted Bunting that really put me onto this recent train of thought... (if you haven't heard, it died). Perhaps there is no real explanation, but after watching the delirious behaviour of ducks crashing onto ice from my condo - with open water in sight - I really began to think that the extreme temperature had more to do with it, and the ice was simply a byproduct. The dark line is open water (the same edge that was open the day before) but >95% beyond that had solid or slushy ice cover... It was ungodly cold this past week (as you may have noticed) and I guess that even a strong offshore breeze wasn't enough to keep the surface clear. 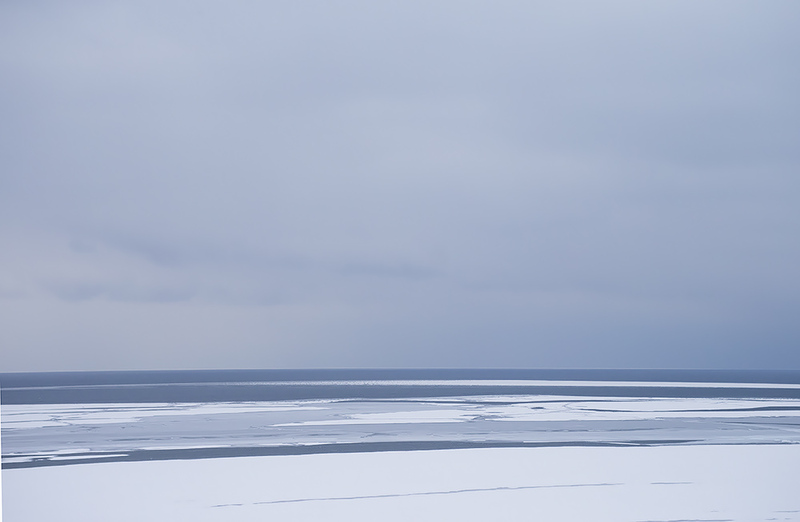 After looking at the ice cover maps it was clear that this must have been a fairly local event, (lots of open water out there somewhere) but it was pretty neat to see. 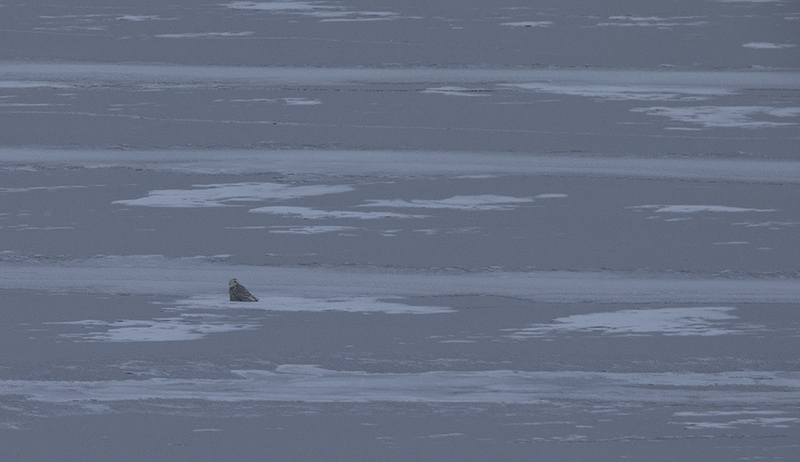 With the ice, came a rather good look (for condo standards) of a Snowy Owl straight offshore at 7:30am this morning. Things change fairly steadily around here, but I have also recently noticed a pretty big decrease in the numbers of Surf Scoters, Common Goldeneye and especially Long-tailed Ducks. The LTDU's seem to be the masters of wandering, so I'd like to think they have simply flown until they found open water on the deeper lakes, but it is also no secret that some birds seem to be trying to find better places to spend their time - and why not? 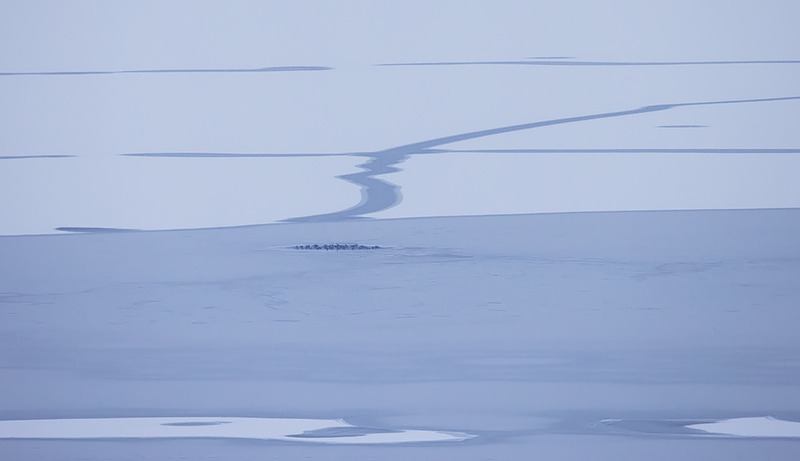 Throughout the day today (on light winds) I watched their remaining open water start to freeze over, until they had little more than slush-trenches to travel through and dive for some food. I get the impression that may offshore "open patches" are little more than areas kept open by the movement/diving/bathing of ducks (often WW Scoters) - allowing them to hop around from one place to the next - but how long will this last? ... Overnight they are continuing to call for calm winds, so I will be interested to see how things are in the morning. Beyond that we can expect colder temperatures, but they're also calling for rather strong winds. I presume the winds (NW to SW) will be strong enough to really break things up around here, and maybe even bring them back to a semi-normal state. It probably won't help on Huron or Superior, where things are nearly 100% covered, but it will definitely change things up locally. Overall it was a pretty neat (and scenic) day of watching the Lake! 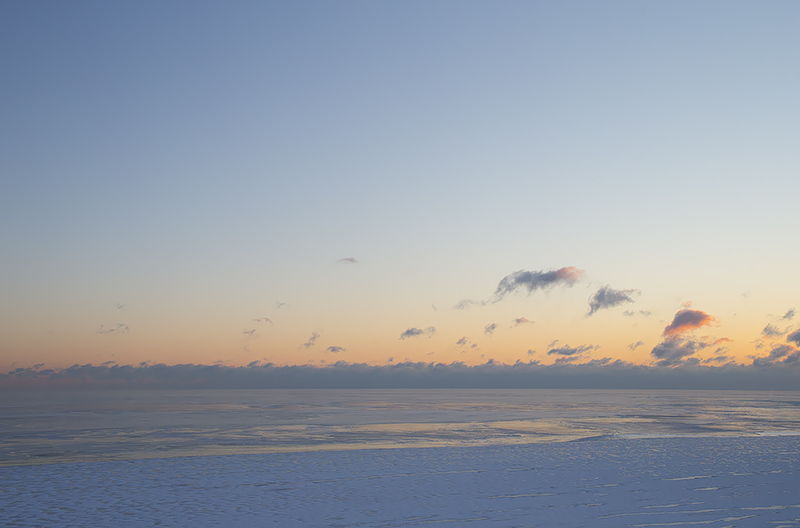 I awoke this morning to a spectacular sight from my condo - a frozen Lake Ontario! Spectacular cold seems to do little in freezing the lake, which was quite evident last winter. Instead, it is light winds and high pressure (along with some freakin cold air) that are the requirements for some clear/smooth new lake ice. For two winters now we have been blasted with arctic air and have watched the bird-life adjust accordingly. I am thankful to watch the ebb and flow of weather from my condo, where I am safe from the elements - yet it's not the same for our feathers friends. 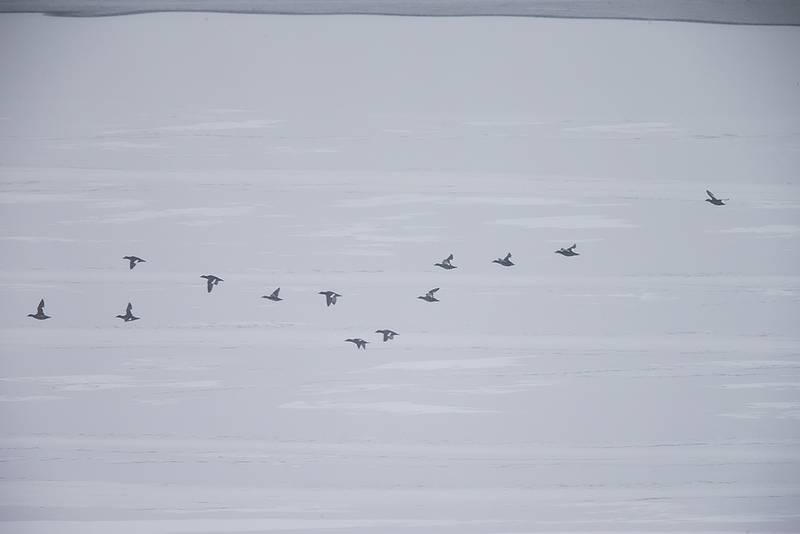 This morning I watched the swarms of Long-tailed (and other) ducks fly in every which way across the smooth (hard) ice surface, only occasionally landing and huddling into groups before flushing with the next passing gull. The Canadian Ice Service updated their graphics at 5pm this evening, and revealed exactly what I had observed - a mostly frozen lake. Which was repeated elsewhere. Image; Red and gray are virtually solid. Last winter we watched as birds struggled with the harsh conditions. Come March, birds (especially Red-breasted Mergansers) seemed to be struggling everywhere we looked. There has been a lot of chatter about "freeze out" birds, and my personal opinion has been that a few of these birds are truly being "frozen out" from their wintering grounds, while the majority we later into March are returning migrants - depleting their fat supplies only to find inhabitable situations when they return here. This isn't a post to debate the two sides - but a handful of Red-necked Grebes have started appearing in unusual locations... Perhaps a sign of things to come. 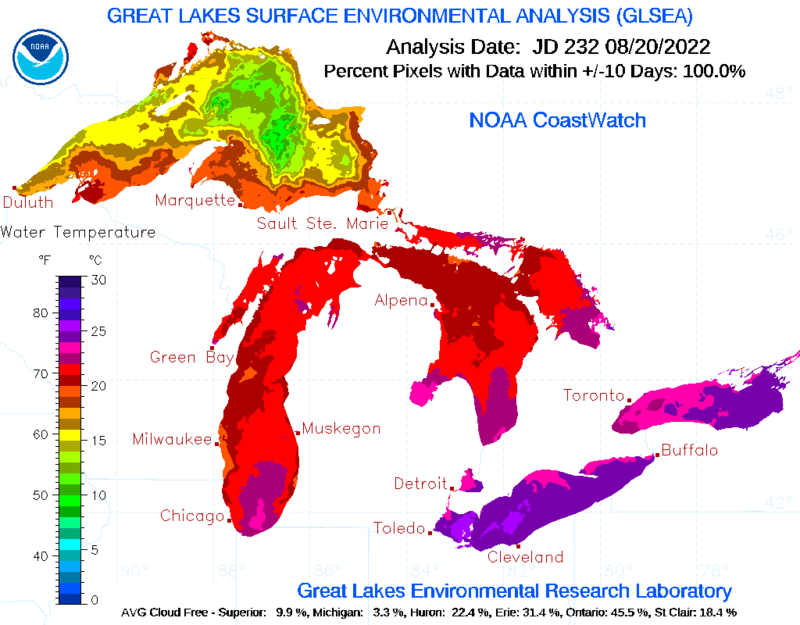 While the record-breaking cold of this past week along with the associated ice-up is likely to effect our birds, I was surprised to see that, on this exact week last year - we actually had similar coverage of ice throughout the Great Lakes. 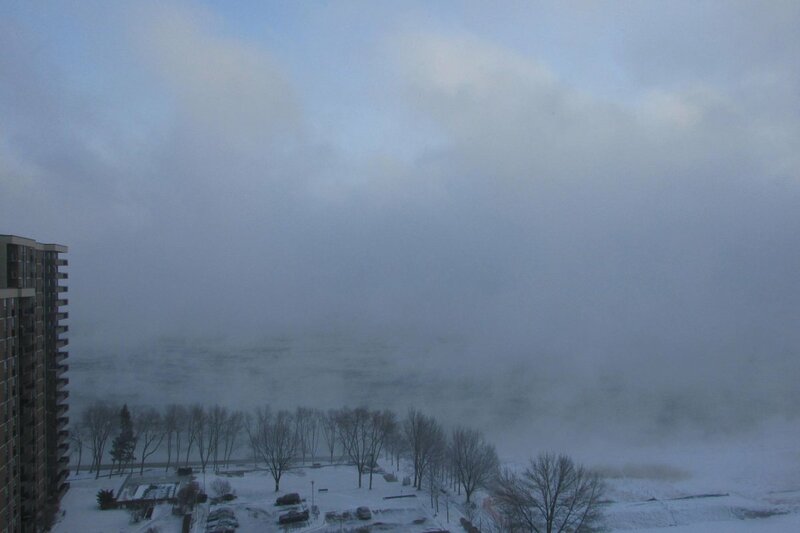 I can only expect much of the coverage on Lake Ontario will breakup by Thursday with strong WNW winds in the forecast. Therefore things may end up being roughly the same. So all of this information leads me to one obvious question. Where are the ice birds? Thanks to a pair of epic irruptions these past winters, I have quickly learned that solid lake-ice is my golden ticket to a Snowy Owl (or three)... As things ice up, I also expect to see a dramatic rise in Glaucous Gulls. Both of these things have happened recently. Therefore I am now expecting something "else" to happen, and I don't think I'm out of line in this hope/request. I want a Gyrfalcon gawd dammit. And with little hesitation, I would trade that for any manner of Ross's or Ivory Gull. These are the grail ice-birds beyond question - and it seems perfectly logical to expect them once the Lake suddenly freezes over - right? Ok, I guess not. I am actually inclined to believe that there is no reason what-so-ever to expect these birds, simply because we are experiencing cold and/or snowy weather. If anything, that may well be reason NOT to expect them. Having studied the patter/occurrence of unusual birds in relation to weather for years now, I can say with some small amount of confidence that these beauties are not hindered in any way by cold temperatures or snowfall. They occur a LONG ways away from my little condo, and conditions where THEY live have to be something special/unique to even consider bringing them to our area. Take my beloved Ivory Gull for instance. The closest an one has been to my place in recent times was 2010 when an adult was photo'd in Toronto. That year saw RECORD LOW sea ice in Atlantic (and North-eastern) Canada. 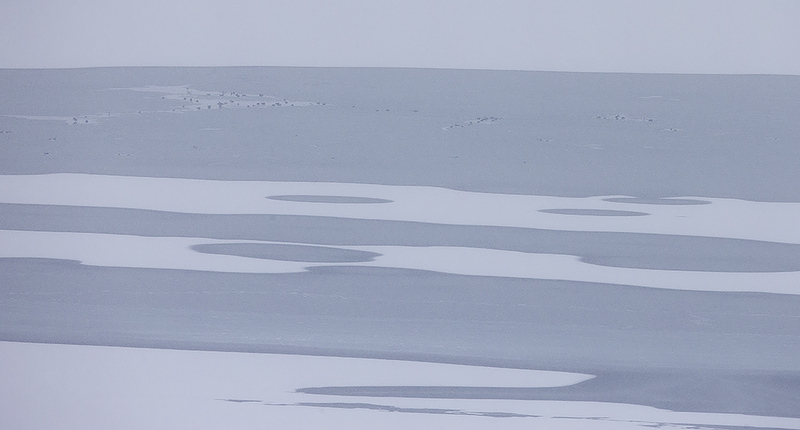 An abnormally cold winter in 2014-2015 may well be creating a fantastical Ivory Gull Paradise offshore of Labrador - providing no reason what-so-ever for them to leave! Thanks to my new found endeavors with twitter, I've recently learned that Ontario Nature has partnered with Lakehead University in Orillia to offer an Ontario Master Naturalist Program. It would seem that this is following in the footsteps of other "master naturalist" programs around North America. I had personally looked at the program offered in Florida, but it would seem to be offered by most states as well as some localized places in Canada (not to mention the registered professional biologist certification in British Columbia). "The program was established to recognize a superior level of knowledge and commitment among naturalists through a designation of Master Naturalist." "The OMNP involves a six-module course of study, along with a 30-hour volunteer commitment. Each of the six modules consists of a half-day session that combines class instruction and field observation." What the duck?! Master-Naturalist status after three days worth of study? What the heck could you possibly learn after three days? "Participants must complete all six modules." Nearly very Saturday...For half a day.... In freakin Orillia... From the beginning of MAY to the end of JUNE????? What self-respecting Ontario Naturalist has time to spare during May and June? But hey! For now, if you have $200 and 20 hours to spare, you too can become an Ontario Master Naturalist. Check back for my next blog post when notification of the advanced "Super Master Naturalist" program is announced. PeregrinePrints.com... Rants Disclaimer: I could probably complain about anything. Disclaimer! Princeton Publishing provided the copies for review! Book cover. Oh how excited I was for this one! Size - 5"x7" - and less than a cm thick. Much smaller than I was expecting, but of no concern. Photographs - Numerous! (90+?) And they're all awesome! The skinny: Ever since the ABA put out a blog post with numerous of Mr. Howell's flyingfish photos, I have been in awe of these little creatures. When word got out about a Princeton book, I had to check it out! The photographs make this book, beyond any shadow of a doubt... They are spectacular... I'm not sure what more there is to say about them, but they are of superb quality, informative, educational and varied to suit just about every possible need. The text is fun and easy to read... It's also very informative... Heck - I wish the book was longer, larger and had more photos - but that isn't a bad thing! The colour scheme works well and the layout is visually appealing. The bad: Two things jump out at me as "bad" - which is a bit of a joke really.... Because the book is awesome, and these are just minor.. But hey! I need to write something. The cover: The fish used on the cover is pretty awesome, but the quality is lacking... It's somewhat blurry... I can only assume they chose the image because it is a particularly colourful fish, and you can see the eye pretty well... Heck - it's an awesome image, and being blurry isn't the full reason i'm choosing to write about this. I'm not even sure I could pick a better image inside the book to use in that context - but I had to mention it! The other thing I didn't like was a bit of photo-shopping on page 10. It is specifically stated to be a fake photo-shopped image to illustrate a point, but I think it could have been done better with a real image... That's it! This is such a fun book, and it's only $13... Get it for kids, your grandparents, anyone... Even if you hate nature (or know someone who does) this is the type of book that could ignite the spark for an appreciation of the natural world. This is the first monthly summary of my 2015 CONDO BIG YEAR!!! I nailed some solid winter birds in January 2015... Nothing too crazy, but Snowy Owl and Common Redpoll would be hard birds to get later in the year (or even next Nov/Dec) depending on how irruptions go. Snow Bunting, Rough-legged Hawk, white-winged gulls etc are all pretty much expected at different points of the year - but getting them out of the way early is probably a good strategy for a big year! On the flip side, there seems to be very few King Eiders (or rare ducks in general) around my part of Lake Ontario... Those would be nice - but there is still lots of time. My high counts of King Eiders have come from April in previous years, so we'll see if that pattern repeats itself. Birding from a condo (which is now next to a major construction site) obviously poses some other challenges, which makes birds like American Tree Sparrow seem like a major score... I keep toying with the idea of placing seed out somewhere I can see from my balcony (but off property)... What do you think - good idea? Or cheating? The only other interesting/funny observation is the total lack of some bird species. I still need American Goldfinch and Blue Jay! Thankfully there is a lot of time (and migration) left in this thing! Check back in March for the February recap.